December has arrived and with it the onset of winter here in the UK. So long autumn. But before I dig out my thermals, arctic mittens and heated boots I thought I’d look at some recent Fall images. In England (and much of Europe) the weather was unusually warm, so trees kept their leaves longer than normal. This meant that the forest fungi which grown on leaf litter and rotten wood were later than usual in appearing. A final burst of toadstools and mushrooms emerged a couple of weeks ago, coinciding with sunny weather - ideal photographing conditions, I took advantage of this to visit my local woods and snap a few of these transitory plants. I packed a camera, 100mm macro lens (although the focal length isn’t critical as fungi don’t usually run away if you get too close…), speedlite flash with a small softbox and a set of orange CTO gels, a radio control system for the flash (makes it easy to position the flash away from the camera), a tripod and ball head (ball heads are by far the best option for getting the camera into the desired position) and donned some waterproof trousers, boots and coat as I knew I’d be lying on the wet ground. I came across the group of Angel’s Bonnet mushrooms (Photo 1) above growing in vibrant moss on a fallen tree. I waited for sunset, when the light was soft and warm, and set the fungi against the ebbing light filter through the trees behind them. I used a speedlight with a 0.5 CTO gel to add a light to the mushrooms, which were silhouetted against the light. The gel was used to make sure that the light coming from the flash matched the colour of the evening sunlight (light from flashes is much bluer than natural evening light and would have coloured the subjects). The flash was positioned low and zoomed to 200mm to help minimise the light spread. 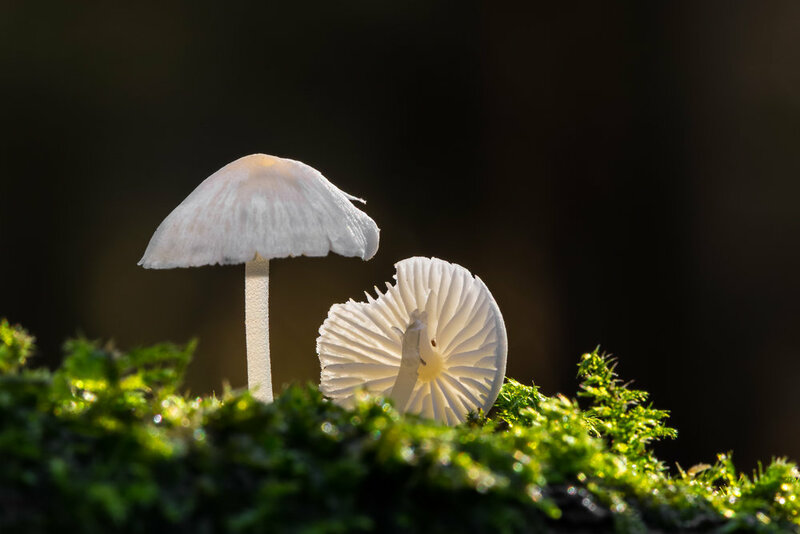 It was aimed upwards to fire over the top of the fungi so that the light falling onto them was from the edge of the flashes' light-cone (a technique called feathering, commonly used by studio photographers). This avoids lighting the foreground too much which can be distracting in a photo, and gives a nicer quality of light on the subject. The speedlight was used in manual mode for maximum control and consistency of the light from one frame to the next and set to just under 1/128th power as it was close to the subjects and I wanted the image to look natural rather than flash-zapped. The near-circles in the background are lens flare which I got by pointing the lens towards the sun and carefully adjusting its position until the flare appeared in the area that I wanted it to. Pointing the lens slightly away from sun will eliminate this effect to give a different type of image, such as that in photo 2. Of course, you don’t have to light your subjects with flash - by turning off the flash and placing the sun behind your target you can create silhouettes. This works best when the image is deliberately underexposed as this has the effect of saturating the light to give deep colours. You’ll also need to choose a subject with an easily recognisable shape. Photo 3 illustrates this approach. (I haven’t yet managed to identify these mushrooms). What, I wonder, might be better than an afternoon’s crawling around the forest photographing fungi? How about photographing fungi with wildlife attached? Like this Red Squirrel - black as it’s in its winter coat - investigating a Fly Agaric toadstool in the forests west of Vienna. Once again I used flash - this time to brighten the squirrel and toadstool a little so that they stood out from the dark green background. The flash is a large Profoto B1 500 w/s unit (roughly equivalent to 5 speedlight flashes in output) with a 1m softbox attached to give a nice soft light. I didn’t need to use a gel on the flash as this shot was taken in the middle of the day when the natural light is a similar colour to that from the flash. I have to admit that before I took this shot I had no idea that squirrels eat toadstools, but you can clearly see where it took a bite out of the top right shortly before I took the photograph. Photo 4: A Red Squirrel in the Viennese Forest, Austria, investigating a Fly Agaric toadstool. Thanks to my wildlife film maker friend Gunther for inviting me to photograph with him in the forest around his home. I was over with my friends at Coda Falconry the other week trying out some new locations for my next flash workshops. (The workshops use captive birds so that we can repeatedly practice the techniques covered). We had a great time lighting up parts of the Lee Valley with assorted flashes and photographing some of Coda's beautiful owls (although we did manage to surprise a couple enjoying a, shall we say, romantic encounter in the dark. Oops). 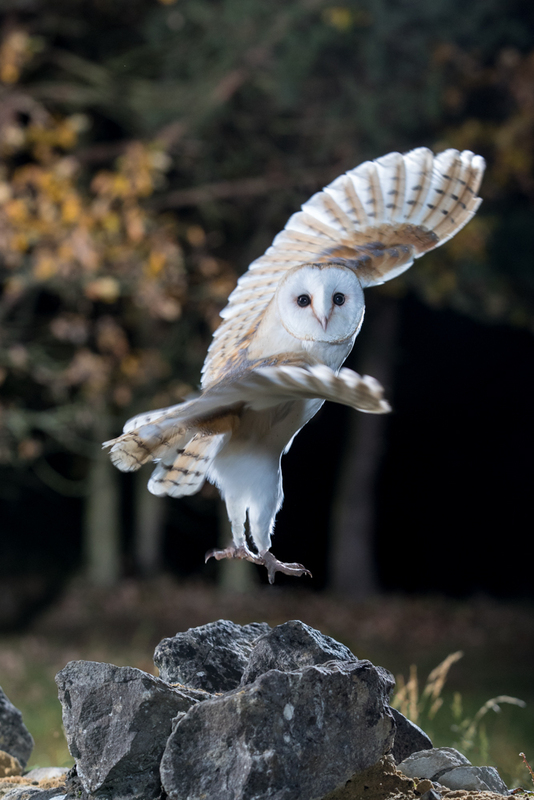 This is Pearl, one of Coda's Barn Owls a moment after take-off as she turns to fly towards us for a food treat. I've removed the leather falconry leggy bits (a technical term) with a photo editor as they were a bit messy. I thought that it might be interesting to include some of the environment rather than the more normal owl and black sky shots so I set about designing a lighting plan. In night photography, anything you want to include in the picture has to be illuminated - obvious but easy to forget! Woodland tends to be pretty dark after sunset, so I had to light the trees that I wanted to see as background with flash. Lighting-wise, this was shot with three Profoto flashes (B1 and B2 units) triggered via the AirTTL controller. The main light (front left) in a beauty dish, back/right side light with a 10 degree grid and barn doors to control light spill and kill flare and the background flash was in a 1m softbox about 2m up. All made use of Profoto's freeze mode to stop the action. The lens was a 70-200mm on a full frame body. One of the problems at night is that you often can't see your subject and if you can't see it, you can't photograph it. So I used a couple of 50W battery LED worklights to light the owl and area around the wall. These also enabled the camera autofocus to work. When setting up the backlight, I turned off the LED worklights and used the modelling light on the flash to preview where the light would fall. Then I took a few test shots with just the backlight flash adjusting power until I had the effect I wanted. (When shooting wild owls I take along a fluffy teddy bear to stand in for the bird while I'm setting up). Note that the backlight flash should be in manual mode - if you have it as part of the TTL groups it will confuse the camera because it's firing light directly towards the lens and the camera assumes all flash light it sees is going to be reflected light bouncing back from the subject. Net result is that the TTL thinks the flashes are too bright and powers them down, underexposing the image (or at least killing the backlight - the exact effect depends on your camera's TTL algorithm, but whatever gear you have things are unlikely to turn out well if you leave the backlight set to TTL). - Beauty dish used on main light as it gives a crisper but still fairly soft light compared to an umbrella or softbox. Gives the owl a little more punch. - Backlight used to provide a light rim light on the owl and help separate it from the background. A grid was used to restrict spread of light from backlight flash which would otherwise cause flare. I ended up adding barn doors to flag (block) light from the camera side as I got some nasty lens flare with just the grid. As a comparison, the Barn Owl below was photographedin the same location but without the use of flash to light the trees. Although I used Profoto battery powered studio flashes, this would work if I'd used speedlights instead with a few caveats. First, I'd need at least a couple of speedlights inside the softbox used to light the trees as a single unit won't provide enough output. There are a variety of multi-speedlight brackets - the image below shows a Pixapro speedlight softbox with built in multi flash bracket - some more robust than others! The speedlight used to provide a backlight should be zoomed to maximum in order to focus the light into a spot beam - this prevents light spillage and lens flare. - Use a 200mm f/2 at wide aperture to throw the background out of focus and get a 3d effect of the owl bursting out of the image (the 200 f/2 is great for this. The Canon 85mm f/1.2 gives the same effect, but AF is too slow to be reliable on a fast moving owl in low light. Another shot (this time a Tawny Owl) at the same location. The flash lighting the background trees has been reduced in power to make the trees a little darker than before.